"First, even the best liner and leachate collection system will ultimately fail due to natural deterioration, and recent improvements in MSWLF containment technologies suggest that releases may be delayed by many decades at some landfills. For this reason, the Agency is concerned that while corrective action may have already been triggered at many facilities, 30 years may be insufficient to detect releases at other landfills." Source: US EPA Federal Register, Aug 30, 1988, Vol.53, No.168, (scanned document). Check-out Peter Montegue's Rachel's for list of other comments in Federal Register by EPA. The U.S. has 3,091 active landfills and over 10,000 old municipal landfills, according to the Environmental Protection Agency. However, in the "good old days," every town (and many businesses and factories) had its own dump. According to the 1997 U.S. Census, there are 39,044 general purpose local governments in the United States - 3,043 county governments and 36,001 subcounty general purpose governments (towns & townships). One suspects that there are many more old and abandoned commercial, private, and municipal dumps than the 10,000 estimated by the EPA. Municipal landfills and their leachate (water) and air emissions are hazardous. Municipal landfills can accept hazardous waste under federal law. An unlimited number of 'conditionally exempt small generators' of hazardous waste have access to municipal landfills. (See 40 CFR 261.5). All landfills will eventually fail and leak leachate into ground and surface water. Plastics are not inert. State-of-the-art plastic (HDPE) landfill liners (1/10 inch or 100 mils thick) and plastic pipes allow chemicals and gases to pass through their membranes, become brittle, swell, and breakdown. "...82% of surveyed landfill cells had leaks while 41% had a leak area of more than 1 square feet," according to Leak Location Services, Inc. (LLSI) website (March 15, 2000). According to Dr. Fred Lee, "detection in new landfills can be difficult since the only way to know this is detection in the monitoring wells. The likelihood of a monitoring well at a single or double lined landfill detecting an initial leak is very small." Monitoring wells should be located in areas most likely to detect contamination (i.e., testing the ground water after it has passed under the landfill.) See: Subchapter I: Solid Waste. Lined landfills leak in very narrow plumes, whereas old, unlined landfills will produce wide plumes of leachate. Old and new landfills are typically located next to large bodies of water (i.e., rivers, lakes, bays, etc), making leakage detection and remediation (clean-up) extremely difficult. This is due to the incursion of surface water in both instances. Federal and state governments have allowed landfill operators to locate landfills next to water bodies under the misguided principle: Detection by monitoring wells can also be very difficult at lined landfills. Lined landfills leak in very narrow plumes, whereas old, unlined landfills will produce wide plumes of leachate. JANUARY 2007: "Lynn, I wish to bring to your attention a new paper has been published on the health effects of hazardous chemical sites such as landfills, where the authors have shown an association between proximity to such sites and increased incidence of hospitalization for diabetes. Please find enclosed a recent write-up that I have prepared on this issue, in which I have included discussion of the diabetes paper, as well as an earlier paper on birth defects. If you or others in your group have questions or comments, please contact me." Lee, G. F. and Jones-Lee, A., “Association between Hazardous Chemical Sites and Illness,” Report of G. Fred Lee & Associates, El Macero, CA, January (2007). This report is a synthesis of about 23 years of work on dry tomb landfills. 27298 E. El Macero Dr.
www.Rachel.org - An excellent site. Search for "landfill liners," "landfills," etc. RECYCLING LEACHATE BACK THROUGH A LANDFILL: Based on the available literature, pumping leachate back through a landfill causes increased decomposition, and it seems logical that it would also create a super toxic leachate. In addition, it would most likely accelerate the decomposition of the liner itself, thereby allowing leachate to contaminate ground water at an increased rate. Rachel's #90 (08/15/88): MSW Leachate As Toxic As Hazardous Waste. Low Level Radioactive Waste by Judy Johnsrud, Sierra Club. EPA's (CESQG) Page - EPA allows an unlimited number of "Conditionally Exempt Small Quantity Generators of Hazardous Waste" to dump hazardous waste in municipal waste landfills. Alliance For a Clean Environment (ACE)- This Pennsylvania group has collected a significant amount of information on landfill gas. * Exact percentage distribution will vary with the age of the landfill. SOURCE: G. Tchobanoglous, H. Theisen and S. Vigil, "Integrated Solid Waste Management, Engineering Principles and Management Issues," McGraw-Hill, New York, 1993. Shown here as reproduced in J.Wilcos, Ph.D., and W.Clister, "Waiting is Over: Landfills Have Clean Air Act Rules," Solid Waste Technologies, March/April 1996. LANDFILL COVER: The EPA allows the use of toxic incinerator ash as daily landfill cover, instead of soil, as the public was originally told. LANDFILL DETECTION: Old, grown-over landfills can be identified by using GRP (Ground Penetrating Radar) or by reviewing county or state aerial photographs that often go back to the 1960's. Landfill Liability: Court Ruling Alters Superfund Landscape: This article is from Pennsylvania's Department of Environmental Protection "UPDATE", September 13, 1996. Landfills & Wetlands: Ninth Circuit Court of Appeals destroys wetland protection, July 27, 1998. NOTE: The U.S. Code (i.e. statutes), always supersedes CRFs: The Code of Federal Regulations (i.e., regulations). LANDFILL LOCATIONS: Use TerraServer to locate Areas of Interest from Satellite Photos! 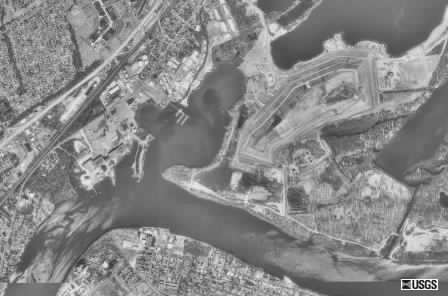 TULLYTOWN LANDFILL (terraced features, northeast of center) On the Delaware River, Tullytown, Bucks County, PA. View this area on Terra Server.